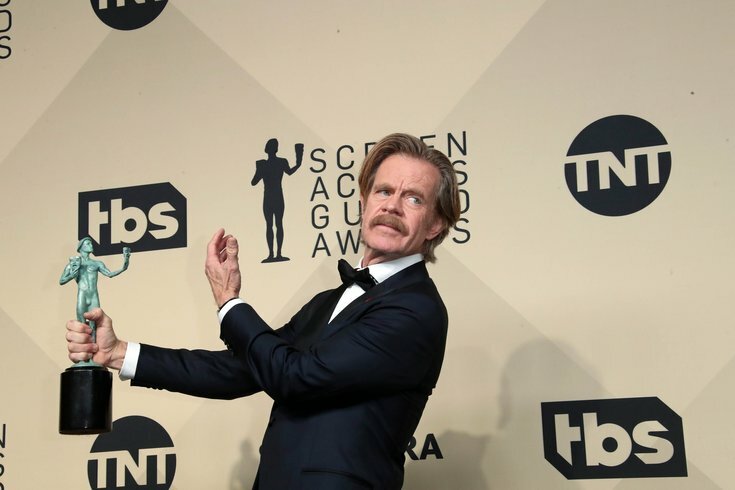 William H. Macy poses with his outstanding performance by a male actor in a comedy series award for Shameless in the photo room at the 24th annual Screen Actors Guild Awards at the Shrine Auditorium. Ephrata is a small town nestled about halfway between Philadelphia and Harrisburg in Pennsylvania. It's also the workout home of muscle man William H. Macy, apparently. The star of Showtime's "Shameless," known for his iconic roles in films like "Fargo" and "Magnolia," was spotted at a CrossFit gym in Ephrata recently. A video posted to the gym's Facebook page Wednesday shows Macy climbing a rope with ease. "William H Macy crushing a rope climb this morning at our gym! Very nice guy!" a caption for the video reads. "He is in great shape- 68 years old and doing legless rope climbs. Pretty impressive!" Now, what is Macy doing working out in the middle of Pennsylvania, you ask? We don't know for sure, but most likely, he was visiting relatives. A 2014 story from LancasterOnline notes Macy was spotted at an Ephrata Walmart at the time. The story links to a Facebook post that reaffirmed Macy is, in fact, a "nice guy." "He was very, very gracious and extended his hand and introduced himself as 'Bill Macy,'" the post reads. "He said that he was visiting family who lives here ..."
Oh, geez, what a nice guy.